Even those of us who write about food (however intermittently) get stuck in our food ruts. Almost every time I go to Sunset Park I end up eating at Lucky Vegetarian. That’s not a bad thing, since it’s so good. But when I read about Chuan Tian Xia over on Eat the World NYC I thought it was about time to shake up the routine. I had two amazing dishes at the Sichuan restaurant on a recent visit, and hope it was just the first of many. The cold Chengdu noodles were as garlicky and spicy as they were wobbly and slippery (which is to say very). But the standout dish was called simple “griddle cauliflower”, heated at the table in a wonderfully flavorful chili-garlic-ginger sauce. 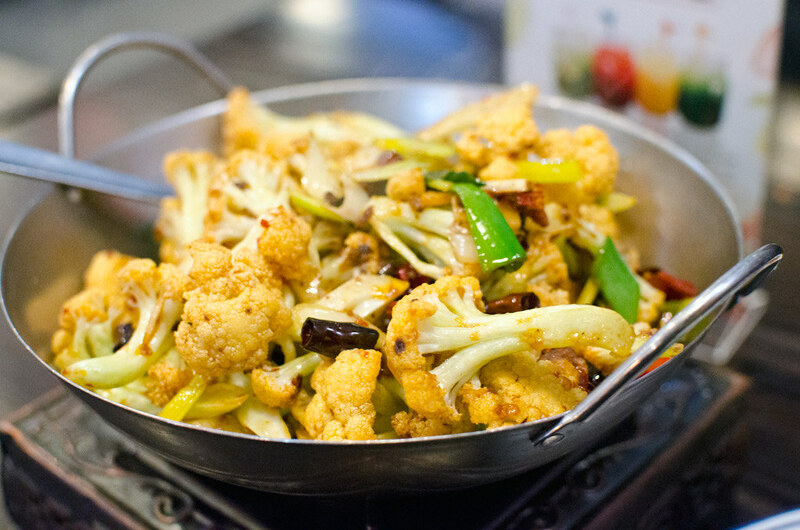 It danced right up to the edge of too spicy without going over, and the cauliflower itself was perfectly crisp. It’s been a while since I was so excited by a restaurant, but Chuan Tian Xia lives up to the hype. This entry was posted in sunset park and tagged chinese, chuan tian xia, sichuan, sunset park, szechuan, vegan. Bookmark the permalink.